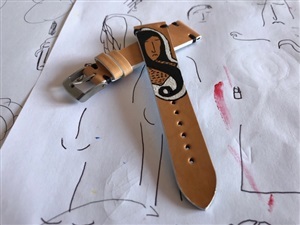 'Femme' is the title of this second collection of hand-painted straps by the artist YCC, available on our digital store www.ilcinturinostore.it in the 'hand painted' section. Inspired by the works of the master Amedeo Modigliani and his minimalist avant-garde in representing the real, with the 'Femme' collection, YCC realizes the shapes of four women on the leather of four straps, in tribute to the four women loved by Modigliani: Beatrice, Simone, Lunja and Jeanne. The same composition of the straps is made around each design: the color of the edges, lining and stitching have been adopted to create a frame of harmony and contrasts with the figures of the artist YCC. Four unique pieces of natural beauty made with hours of surgical work, an ultra limited series collection that enhances the features of its creator. If you are looking for something special as a frame for your watch, the 'Femme' collection is definitely for you. Go on our online store and do not miss it!